It's dark, it's brooding, some people mistake it for cough syrup. Yet the Italian amaro Fernet Branca is the favored drink (let's be honest: favorite shot) of bartenders across the country. It seems like they must give you a bottle when you get your bartending license, along with the fitted vest and mustache-grooming kit. Though its American popularity is a recent development, Fernet Branca—which most folks just call "Fernet," though there are other Fernet brands, too—has quite a history. First produced in Milan in 1845, its precise formula is a tightly guarded secret; but here's what you need to know: It's bitter. Not bittersweet like Campari, bitter in a spine-tingling, scalp-prickling, smack-you-in-the-face kind of way. But once you get past the intensity, you can start to appreciate Fernet's varied herbal flavors. Think of these three drinks as your introduction to the world of Fernet; start here, and pretty soon you’ll be throwing back shots with the mustachioed bartenders at your local. 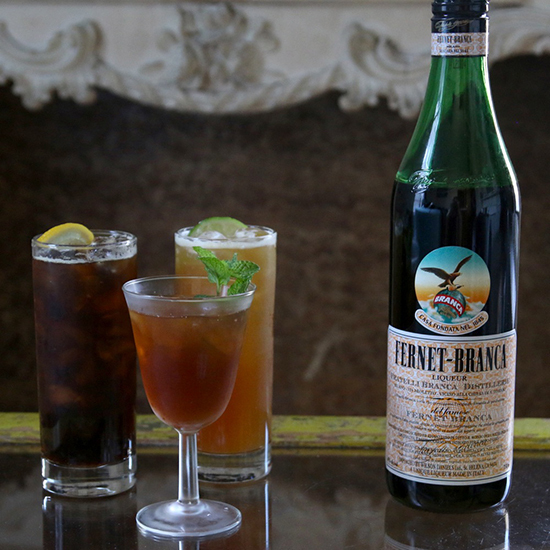 Head down to Buenos Aires, and you'll find that Fernet con Coca is as ubiquitous as Jack and Coke in the States. (Argentina is one of the rare countries on the planet where Fernet is actually popular, not hipster-bartender popular.) Seems weird at first, but the soda's distinctive flavors and subtle spice pair perfectly with Fernet. Instructions: In a tall glass with ice, combine 1 1/2 ounces of Fernet and 4 ounces of Coke. Garnish with a lemon wheel. In this drink, we're pairing Fernet with slightly vegetal añejo tequila and slightly spicy ginger beer—perfect matches for the amaro's herbal-spicy-crazy flavors. If you're still easing into the world of Fernet, this drink is a great gateway. Instructions: In a cocktail shaker with ice, combine 1 ounce of Fernet, 1 ounce of añejo tequila and 1/2 ounce of freshly squeezed lime juice. Shake that all up and strain into a tall glass with fresh ice. Top with 3 1/2 ounces of ginger beer. Garnish with a lime wheel. The American Bar at The Savoy in London has a special place in cocktail history; The Savoy Cocktail Book is a bible of sorts for bartending. The Hanky Panky listed in its pages is a gin-vermouth concoction with just a dash of Fernet; we're taking that idea but upping the Fernet quite a lot. The vermouth and Beefeater Gin (our brand of choice for this cocktail) smooth Fernet’s herbal bite a bit—but only a bit. Instructions: In a mixing glass with ice, combine 1 1/2 ounces of gin, 1 1/2 ounces of Fernet and 1 ounce of sweet vermouth. Add a dash of orange bitters. Stir until well-chilled. Strain into a cocktail glass with ice. Garnish with a big mint sprig.